SuperRam allows you take control of your computer’s memory, how physical memory is allocated and help determine the performance of your computer system. Windows routinely allocates memory to applications, games and system processes; over time the memory becomes completely used handling all of these tasks. With SuperRam, memory management is tuned to maintain computer stability but a greater emphasis is placed on computer performance. 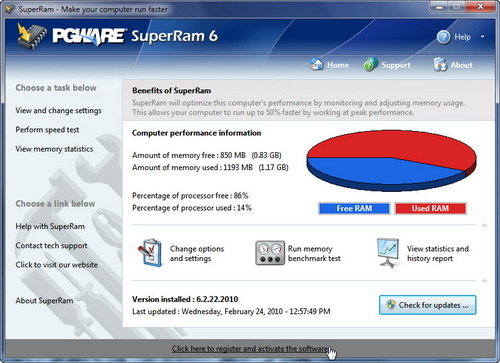 Once installed SuperRam begins to monitor the total amount of memory your computer has installed, it also monitors when your computer reaches a threshold of memory to maintain, when that threshold is reached SuperRam immediately will release all memory that it determines can be released on the computer system back to Windows. When SuperRam is installed any new application, program or game that is opened will use physical memory installed on the computer and placing applications that you opened previously to use virtual memory. This allows software to run with an emphasis on performance when performance is needed; such as when playing games, editing photos/videos, using processor and memory intensive applications. Latest Update : 6.2.22.2010 – Resigned all files with Microsofts new authenticode signtool program. Fixed a problem in the installer program which did not close windows properly when updating the software to a new version. Removed old Windows 95/98 Windows api code that has been deprecated by Microsoft and updated it to newer api. Optimizes computer memory by freeing wasted memory back to the computer, giving applications access to physical memory. Runs as a Windows Service application, which allows the software to run even when you are not logged into the computer. Handles up to 2 TB of RAM on Windows 2008 and up to 128 GB of RAM on Windows 7 and Windows Vista. Windows XP, 2000 and 2003 still support up to 4 GB of RAM. Advanced settings added to prevent excessive memory defragmentation, monitoring processor usage and battery status. Software supports multiple languages and translations of all visible text to allow users all over the world to use SuperRam in their native language. Software was entirely developed and built in the United States. Technical support also is based in the United States. Try before you buy licensing with dedicated software updates and quality around the clock technical support.